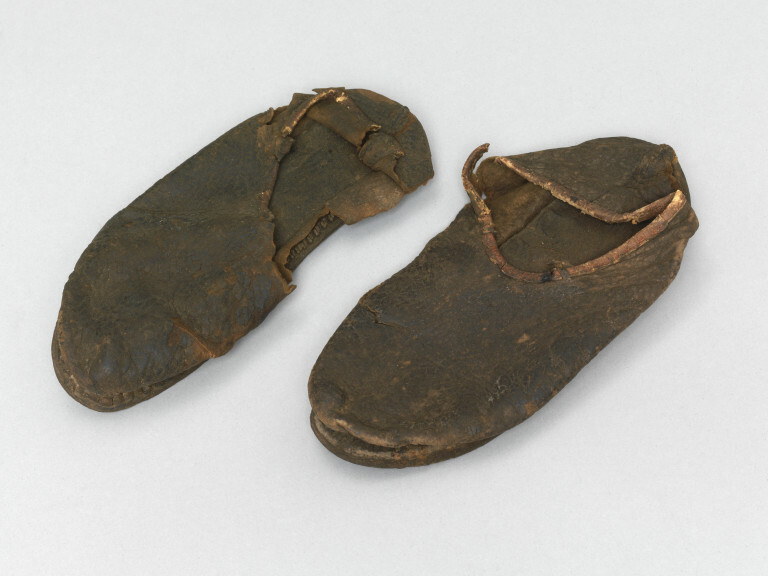 A pair of brown leather shoes, Egyptian, ca. AD700-1000 (possibly). Made with the welted technique. Acquired from D.B. Myers. 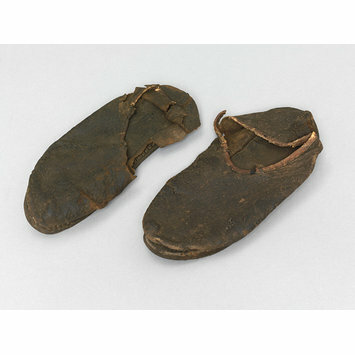 Coptic footwear was primarily made with leather, often using the turned technique, to produce a slipper or shoe with a straight sole. Slippers often included a rand at the vamp and a fibre padded sole sewn together with prominent stitching or insole tab. They show variation in the form and height of the instep. Shoes were generally slip-ons and also show variation in the form and height of the instep. Footwear was highly decorated in geometric and floral designs. Often a variety of techniques were used in combination, with the most popular being dyeing, gilding, openwork and appliqué. A pair of flat, brown child’s leather shoes. Egyptian, ca. AD700-1000 (possibly). Semi-pointed toe and round heel. Welted construction. Treadsole: Swayed. Leather stitching round perimeter shows through and around topside perimeter where sole is attached to upper. Midsole 1: full length. Midsole 2: Begins at waist and goes back through seat. Upper: One piece, high throat. Topband (5mm) possibly red leather and sewn with running stitch.